Funny that Doc lambastes Facebook, but doesn’t go after Berkman Center donor Google. I hope their hands are at least warm! Great post, now we know the problem, what’s the solution? Brett, c’mon, be fair – note the sentence in the post “Eli Pariser calls both Facebook’s and Google’s data-based assumptions about us …”. 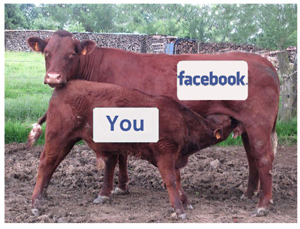 With all the hype about the Facebook IPO, basing a post around Facebook isn’t unreasonable. Doc, regarding – “He calls empty the glass I’m working to see filled. “, I’d say it’s more along the lines of “He calls untreatable the disease I’m trying to cure with my innovative methods”. There’s people who think cancer can be cured by coffee enemas (I am not making this up!). I hope the problems with getting caught up in something like that are obvious (i.e. even if well-intentioned, even if the proponent really does believe in the coffee enema cancer cure, there’s all sorts of downsides). I’ve been saying this for a decade. I simply don’t see how anyone in online advertising is making real money or getting real results. I’ve been on the web for 13 years and never once clicked, opened or watched an ad on purpose. The Google Exposure. A sense of bewronging. What happens when Google buys Sprint, too? (In which I also put in a kind word for WISPs, fwiw.) On advertising and search. I could go on, but would it make a difference? A yes or no answer will do. Thanks for this great analisys. Would you say that the case is different for B2B companies? It seems to me that they successfully implement content marketing strategies instead of aggressive advertising given the nature and complexity of their products and services. They can name their terms of services and “intentcast” needs, manage their own relationships with vendors etc. So, in short, the VRM imperative is this: what marketplaces would benefit most from empowered buyers specifiying their needs up front? Well, Facebook & Google should have a strong suspicion I’m planning a wedding, and, indeed, neither have any value-added service to offer us in terms of connecting us with the small businesses who can meet our specific needs. So any point about Facebook being incompetent or unseemly generally seems immaterial to the above. I still am having trouble grokking Don Marti’s point about the size of the ad campaign being interpreted as a proxy for the quality of the product — I could not track down his sources on that to anything substantive. As far as I can tell, the signaling problem is the best explanation for why the most trackable media are pulling in the lowest ad spending per unit time. You could see VRM as a qualified leads business, in which the leads themselves do their own qualifying. What marketplace wouldn’t welcome that? Either Facebook or Google could get into the VRM business, if they liked. I’d welcome them. But there’s still plenty of money helping advertisers guess at what prospects might want, so they’re not inclined. The article is from 1984, not 1994. The article is a lot of math; the objective of the investigators, as far as I could tell, was to validate the price-signaling theory put forth by Philip Nelson, in the 1970’s. I wouldn’t dismiss an academic theory from the 1970’s out of hand; I just suspect that there’s been a lot of research which expanded, or otherwise contested, parts of Nelson, not to mention changes in consumer behavior. Forty years later, we are in a world where the full information about the prices of goods, and information about the quality of them, is at our fingertips. First, thanks for catching the typo. Should there be a second edition (and I trust there will be), I’ll take the correction. Second, the book was informed by more sources than were cited, though I tried to be as generous as I could with endnotes. That one source was old does not mean they all were. Nor, as you agree, does the antiquity of a cited source make it irrelevant. Third, I don’t believe we are yet in a world where the full information about anything is yet at our fingertips. There is certainly an abundance of it out there, but finding it all, and making sense of it, is not a given for everything. True, times have changed, and are changing still. One of my many cautions in the book is toward assuming that today’s big-data-driven hyper-personalized online advertising, much of it based on degrees of surveillance that are unknown to the user, and mostly out of his or her control (that is, if he or she wishes to participate in the commercialized Web), is normative only at this moment in time, and not fully understood, even by its practitioners, even if it is fully rationalized. It doesn’t hurt to bring in some proven principles of advertising (such as branding of the old-fashioned sort), to help figure out why some things work and others don’t. Fourth, I’m not playing the guru here. I’m just a guy who thinks the development of business in the networked world is still at an early stage, and that equipping customers with tools for both independence and engagement is an opportunity worth exploring. I do believe that the Intention Economy is the likely result of that, but hey: I could be wrong. I wrote the book to think out loud about the possibilities, and to both stimulate more development while supporting the develpment work already taking place. This work isn’t happening because I’m playing the guru (which I try not to do), or talking about stuff at conferences. Most of it started without my involvement at all. But there is in the community a sense of common purpose. As groundswells go, the elevation isn’t high yet. But a lot of good, smart and hard-working people are shaking it, and I think that deserves some respect. Fifth, since you’re a local, I hope you can make it to my talk at Harvard Law School on June 11, and participate as well. And pass the word around. The students are gone then, along with most faculty as well, so the gathering will probably have a different mix than the usual events there. What’s the disease? Serious question. Doc, we should get into the Harvard library again. I might have a couple more citations to track down. It seems like the results from user-targeted ads are supporting some of the 1970s-1980s models. A number of sellers have the same problem with ads that they have with their own web sites. They know what they want to tell the buyer, and what they want the buyer to see. This can make it very difficult for a potential buyer to find information that will lead them to the product they actually want. Don, getting into the Harvard library non-physically requires an affiliation both of us lack at this point. (Mine ended when the fellowship ran out. Even though ProjectVRM is still at the Berkman Center, the library privileges don’t go with that.) But I’ll see what I can do. I recently touched upon some work involving Australia’s major directory service (Sensis). They are having some major trouble with their business model because simply building a list of phone numbers is not sufficient where Google can provide full details about a company. However, it occurs to me that HAVING a complete set of contact information about every company in the country puts the Yellow Pages in an enviable position in terms of setting up a VRM type web-site. All that would be required to in the first draft would be some social media type functions such a favouriting, sharing, providing feedback etc. so potential consumers can rate potential providers for themselves. Eventually some deeper relationship building tools would be needed – but not a lot. More like singles introduction sites rather than sales. The trouble is that it would cause a 180 shift in perspective from the company providing the VRM service – from vendor advocate to customer advocate. That and understanding how the monetisation works. Probably why investors are not involved is that they don’t see how the idea makes money – it is easier to collect a lot from a few than a little from very many. Doc, in those articles you don’t level the same serious criticism at Google that you do at Facebook above. The model that can enable the “imagine you could” list is that of Diaspora, whereby you own and control your data but can still disclose and share it with others as you want. This model is the way forward for medical and health, financial sharing etc. I imagine the buyer seller transaction as it has existed for time eternal .. buyer meets seller and a negotiation begins .. but with the Diaspora model you can open your “imagine you could” list to seller at that time and go from there. Caveats here are that both parties are ready to be flexible enough to respond and deliver negotiations. I am not completely certain though that the Facebook model will fail .. with better AI for lack of better term, better algorithms, data mining, whatever… its representation of life is going to get better. At some point it will be indistinguishable .. right? Isn’t that the trajectory? But personally, I want my data, I want to share it when and how I want. I want reward for it .. if advertisor is paying, then i wnat that affiliate payment or a cut, or a discount when i buy. Great article though .. really got me thinking. 1: Cancer is a disease, an uncontrolled growth of cells. Therefore, to cure it, I’ve come up with CoffeeEnemaDiseaseManagement. 1: Hey, I’m trying to *do* something here! I’m trying to *cure cancer*. 2: But coffee enemas won’t cure cancer. 1: How do you know that? If it works, it’ll be great! 2: Well, it’s been tried and tried and tried, and never worked before. 1: But has this particular blend ever been tried? And that brewing system? Why not stop carping and being negative, and join our team of coffee roasters? 2: What reason could any of that make a difference? 2: How many tries before it can be said to be useless? So the disease a social relationship pathology within business in which both consumers and customers are regarded as non-human. Do I have that right? If so, we agree on that. Then how would you treat that pathology, if not by anything I’m prescribing, or anything on the list of VRM developments and related projects? I doubt I will ever criticize Google to your satisfaction. When recalling how some of these criticisms were lodged against Amazon in the past, and thinking about how at least Amazon was using the information to sell their own products, I started to see all of this more in the vein of a huge multi-level marketing scheme, but one in which there are no middle men. The point being, if no one is actually buying any product, but just adding new people, the model will implode. Close enough. We could refine, e.g. “dehumanizing” might be a better word than “non-human”. But I think we actually are broadly in agreement on initial statements. The difficulty is what comes after. Ah, this is the problem. I recognize that you and many Berkman people work in an environment where much of what you can say is *immensely* constrained by what’s acceptable to corporate executives. That’s why so much of what comes out of it is roughly “Here’s a techno-gimmick that’ll solve this tough social problem, and look, big business types, there’s opportunities to make money off it, or at worst, it’ll solve some negative social effects of your business without bothering you at all!”. I grasp that approach is considered far-left radicalism in a relative sense, for not being as slaveringly plutocratic as those who wallow in corporatism and think the function of intellectuals is to justify big business (as opposed to putting a human face on it and abstractly sympathizing with some negatives). So if I start saying even the mildest things – gee, what does work, in terms of favoring more human(istic) business arrangments? – I have a sad feeling even the mildest aspects will be off the table in terms of utility to you. Are you advertizing your book on Facebook to ???? Q) Who is the most important person at The New York Times? A) Their best ad salesperson. Having been first a writer then a content creator, I understand this paradox–even at the top of the content food chain, the commercial interest predominates. Is this wrong? Not at all–it provided us with a transactional model of information generation and dissemination that has served well for over 150 years. But to Doc’s point, we are witnessing, finally, the birth of a new model that represents a substantive break with the past. It’s obvious that Facebook represents the last hurrah of the old order–the last “mass medium” that served impressions of commercially-oriented information that subsidized the production of the high-value information the reader initially sought. The new order–the discontinuous model that alters the matrix of financial exchange for information, falls within what Doc describes as the VRM. The notion has been inchoate since Toffler’s pro-sumers from the early 80’s; now people will have the ability to exercise agency in the commercial domain for information in ways never before seen. And Facebook is most assuredly not a platform for that. The question is how to get enough people up to speed in the skills needed to accomplish makes the transition to self-aware info pro-sumers. I think Howard Rheingold has done a nice job in his new book “Net Smart” of laying out a kind of curriculum for people to start building these kinds of personal toolkits, as well as exploring the critical thinking skills necessary to proactively and sustainably develop this new kind of agency. anonym, I’m not advertising my book anywhere. I don’t believe the publisher is, either. We’re both working to promote it, however. I’ve been advised to create a Facebook page for it, but I haven’t. In Chapter 16 of the book I run down a list of sources, starting ahead of Toffler (but including him, to whom I owe much) all pointing in the direction you describe. Wish I’d known Net Smart was in the works. (See it came out on March 12.) Just ordered it. And don’t assume I’m in lock-step with the Berkman Center. That’s never been the case. To my knowledge, ProjectVRM is the only project in Berkman history that set out from the start to encourage development projects, including commercial ones, to address a market issue, rather than a social or a policy one. FWIW, I am also not constrained at all by “what’s acceptable to corporate executives.” That I do try to talk with them (or at least some of them), and make sense to them, does not mean I am constrained by them. Nor does it mean they’re the only people I talk to. I’m wondering… Would what Don Marti suggests here be something you’d find agreeably prescriptive? Or, pivoting off VRM as it does, is it more coffee enema? That link also mentions what I see as the biggest obstacle to VRM — many vendors rely on confuseopoly and other non-transparent price discrimination. Making the company more transparent to VRM tools (whether controlled by the user or 4th parties) makes those two tactics harder. VRM obviously won’t work, at least in the short run, where confusopoly and other gimmicks are the norm. But the world is bigger than that. In the book I give the example of Trader Joe’s and other retailers that essentially have no marketing and go out of their way not to play the gimmick game at all. Regarding – ” … but the characterizations — especially when they ring so false to me — are digressive at best” – no offense intended. I had a longer reply, but I decided to dump it as I’ll probably get myself in trouble. We are talking somewhat at, not exactly cross-purposes, but a very different view of the meaning of certain phrases (i.e. like to some people “Socialism” means the Soviet Union, while to others it’s Barack Obama’s economic policies). I’m worried that I’m getting myself into a hole here, and I’d better stop digging. I always resolve not to do this stuff due to the horrible risk/reward ratio, but so far I always break that resolution. Appreciate that, Seth. I’m also cool with taking it offline if you like. Thought-provoking piece that punctuates the Facebook Fantasy – but I am not entirely convinced that salvation lies in VRM. Perhaps VRM just looks at the same problem from the other direction when we should be re-defining the problem entirely (shifting from channel identification to behaviour identification). You’ve responded to my critique of your book chapter (and blog post) by asking me to spread the word about your talk? What I want is for somebody with access to your sources to put it in a much more clear analysis. I continually find you still leaning on these broad statements with the flimsiest of backing. Today you are telling us not only that brands are important, but that they are the most important thing, because of this signalling theory. You had no idea what the actual source of this was, trusting that readers would be content that it was an academic journal article that they would probably never read. What is it? Are brands antiquated, evil, or… essential? Likewise, are consumers better served by economies of scale (which can underwrite larger advertising campaigns), or by smaller vendors which can engage in more direct conversations? Easy answer: it depends on the industry and type of good. Follow-up question: in which industries & goods, how do these different drivers apply? That research would be worth buying, and promoting. The point for me is… I believe that the efficiency of advertising is not the right question, nor is the targeting, not segmentation, nor value for money, nor ROI. Advertising cannot simply be boiled down to such a one dimensional ratio as there is more than one reason that Brands do something. The observation is that the internet can be both more effective and less efficient at the same time, this does not make it a winner or a loser. My insight would be that digital services bring what other non-digital services cannot bring – Digital delivers a closed loop feedback system and that is where the value is…..